We’ve been getting some great feedback on the Festival, which is of course very heartwarming for all the members of the DMF Committee and all our wonderful sponsors and volunteers. It’s just an excellent festival, I have been coming for the past five years and enjoy every minute. Thank you for being so good at organizing the event. Brilliant. Love it every year. Long may it continue. Can’t wait for next May. This was our third year. we only came across it by accident when we stayed at Noss marina three years ago. Absolutely excellent festival, looking forward to next year already. Thank you to all the people who worked so hard to put it on. Just thanks again for putting on an exceptional event. So much fun and something to be very proud of in Dartmouth. We have lots of amazing volunteers willing to work so hard putting on events of behalf of the town. Music and Food in Dartmouth second to none!! 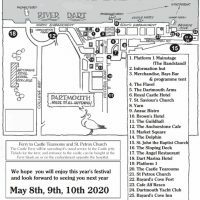 I used to live in Dartmouth when the festival first came into being. Having returned after fourteen years all I can say is Wow! It has grown into a fantastic event. Well done to you all for building on what was already a great weekend. We have already booked our accommodation for 2017 and are spreading the word! We saw Martin and Eliza Carthy and couldn’t believe that was a FREE event! Lovely atmosphere as we walked round. Really like Market Square events. I cannot fault this festival and a huge thank you to all involved. Thank you – we loved it and we will be back and will bring our friends next time! The only downside was that there was so much good stuff on that we couldn’t get to see it all. If you enjoyed the Festival and would like to tell us what your favourite experiences were, we’d love to hear from you. Please e mail valdepledge@hotmail.com and I’ll be happy to add them to our blog!